Pamommy Loves to Run: Running with a friend.... good or bad?? Running with a friend.... good or bad?? I have come the the realization that I am going to be a once a week kind of blogger right now. This past week was crazy hectic with sports class, swim lessons, preschool, gymnastics, 2 birthday parties in two states and a 5K on Saturday all the while trying to get my miles in and get my May goals in check!! I ran the 5K with my fast running friend and while she drives me to run faster, I really don't enjoy running with others. I know it sounds weird but I think I get more enjoyment out of running alone than with a group. When I started out on my running journey, I ran for my ALONE time. I had newborn twins and a 15 month old daughter at home, had stopped working all together and was trying to adjust to being a SAHM. I really don't care what people think about SAHM, we do work, we do have stresses in our life and yes sometimes it is easier when the kids get sick or something comes up, not having to shuffle around work, it was something that I was not in anyway prepared for. I enjoy my time on the road whether it be a 25 minute quickie or a 2 hour long run. My husband has been very supportive of me throughout this whole process and I am very thankful for that. So back to the 5K...... I did PR this weekend. 25:22 was my official time. I say I will be happy once I get to 24 minutes for a 5K and into the 1:40's for the half but feel like I should be happy with just running. I have an inner competitive person that lives in me and she is harder on me than any person I know. My running partner beat me by 9 seconds but that really doesn't bother me. The reason I dislike running with people is I feel like we have to talk and the two people who I typically race with depend on me to pace them. Enough complaining about that, I should just be grateful that I could run another race. 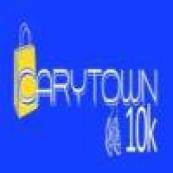 This weekend I have a 10K with the ladies from my running group. I am running this one with my fast friend again so we'll see how happy I am after this race too. The following weekend I have the Foam Fest which I am DREADING!!! Obstacle races scare the bejesus out of me. I'm always uber concerned I will get injured as I already have knee issues!!! I get it, I am a mom to a preschooler and ever since she was born I love the time running to focus on me :) I do run with friends 1-2 times a week, usually because I am coaching but I like my runs to do what I want, get "lost" in my thoughts and the world around me and not worry about what to make for dinner or the next mommy issue! Way to go on the 5K! You rocked it!! I do like running with friends, but only if they are my speed or faster. Otherwise, I'll run to help a buddy reach their goal, but I'd prefer to run alone or with someone my pace or slightly faster than me.